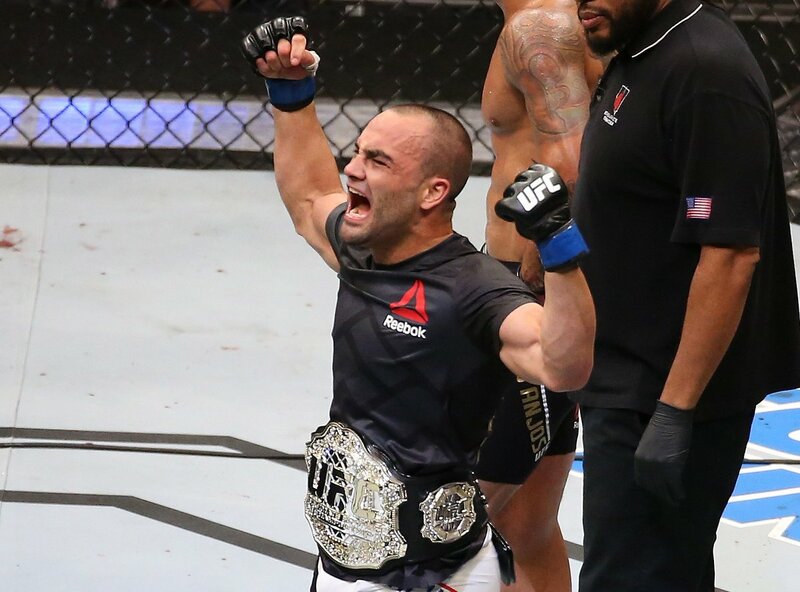 Eddie Alvarez shocked Rafael Dos Anjos with a first-round stoppage at UFC Fight Night in Las Vegas, stunning the Brazilian to become the new Lightweight champion. The challenger overcame an early storm before stunning Dos Anjos with a right hook, followed by an onslaught, whereby the champion did fight on before being pummelled up against the fence and the referee calling it off - atop a sensational card to kick of International Fight Week. Vicente Luque kicked off International Fight Week with a second-round submission victory over Alvaro Herrera. Living up to his name as "The Silent Assassin", he wore down his opponent with strikes and easy-to-the-eye takedowns, before managing to sneak in a D'Arce choke forcing the tap late in the second frame. Marco Beltran secured his first UFC finish after up-kicks helped him to a second round rear-naked choke submission against Reginaldo Vieira. In the first round, he used his reach advantage to work in and out, landing strikes although getting pinned up against the fence where he managed to work his way back up. Things were more wild in the second frame, with both stumbling after trading shots, before the TUF Brazil winner took things to a mat with a smooth takedown. Eventually, he would find himself trying to stack guard, but was struck with two up-kicks, leaving him dazed, before pounding him out and finding the opening for the submission. Established jiu-jitsu champion equipped his world-class skills to secure an armbar in the dying seconds of the first round, after stumbling Lukasz Sajewski at least twice in the course of their fight. On the feet, Sajewski did well to switch stances and work the body, although the fight would soon be paused momentarily after an unintentional groin strike left the Pole in agony. When it continued, he was soon wobbled with a right hand but managed to recover, before he was under a heavy barrage up against the cage. When things took to the mat, Burns eventually slipped in the armbar forcing a quick tap. Maintaining the trend, Felipe Arantes secured a verbal submission win over Jerrod Sanders in the second round. Things were well matched in the first frame, with both tentative at occasions, until things went to the mat, where Arantes - on his back - found the armbar, and it was tight forcing Sanders to verbally submit and give the Brazilian a huge victory. Pedro Munhoz weathered an early storm to pick up a resounding victory in just over 2 minutes. Russell Doane came flying out of the traps, with hard body kicks and landing flush with rights and lefts. But his chin stood the test, before he threw some for himself with both competitors throwing elbows at one point. "The Young Punisher" was left with a wound for his efforts, before in the clinch, Munhoz wrapped his arm round Doane's neck and tugged him down for a tight merciless Guillotine of which Doane eventually succumbed to. Anthony Birchak eked out a split decision victory after a thrilling war with Dileno Lopes in the sixth fight of the evening. In the first round, Birchak managed to survive a rear-naked choke by carrying the weight of his opponent on his back for quite a while, with even enough time to move to the fence near his corner for advice. He managed to outstrike him when things got back to a striking standpoint, before there were fireworks in the second round when both men were wobbled going forward. They acknowledged the respect for each other to start the third, and it was more of the same, trading to the finish before a stare down in the final seconds. The judges could have scored it either way, but two did in favour of Birchak who picked up the win. The judges night would only get harder as ​John Makdessi got his hand raised after a riveting stand-up battle with Mehdi Baghdad on split decision. The French-Algerian fighter had plenty of early success, using his range to find combinations and nail them moving in. But in the second round, his rhythm was disrupted as Makdessi began to land, and after getting hurt himself, he would stagger Baghdad and have it close to a finish, but both remained durable and saw it out. In the final preliminary bout, Alberto Mina scored a major victory for his 13th win and to stay undefeated as he knocked out veteran Mike Pyle with the help of a spectacular flying knee. It came in the second round, after Pyle remained defensive in the first, although would get tagged and survive. There would be no escape in the second frame however, as he charged towards him landing the left knee, sending Pyle to the canvas, and some strikes on the mat showing enough was enough and the referee calls it off. Joe Duffy would then kick off the main card with fireworks - and very quick ones in those. Within the space of some 25 seconds, he dropped Belal Muhammad with an overhand right, before following it up with punches, then taking his back and locking in the rear-naked choke for a submission triumph to get back to winning ways. Alan Jouban then welcomed the undefeated Belal Muhammad to the organisation, taking his untarnished record in the process of a unanimous decision win, after a superb slugfest. In the first round, Jouban knocked his opponent down on two seperate occasions with a left hook and head kick, but somehow the debutant survived and was able to fight. He was dropped again in the second round before Muhammad turned things around and began to find his range, unloading to try and get the knockout. Jouban managed to survive and pull through, and he made it to the decision where it was unanimous in his favour. In the evening's co-main event, Derrick Lewis scored a controversial split decision victory over Roy Nelson after "The Black Beast" was unable to break through the legendary chin of his opponent. Lewis targeted the body from the outset, although Nelson's game plan was clear - to equip his wrestling. He clinched up against the fence and landed 7 takedowns over the course of 3 rounds, although was unable to do much damage with it. Nelson was back tracking as Lewis unloaded more shots, which would only increase before he rocked his opponent late on, but it wasn't enough for the finish. Two judges determined it in favour of Derrick Lewis, giving him the split decision victory. In the main event, Eddie Alvarez stunned Rafael Dos Anjos with a blistering first-round stoppage, overcoming the odds to realise his dream as the "King of the Underground" conquered a man who many believed could not be stopped. The Brazilian opened by applying lots of pressure looking to find the chin, before stuffing Alvarez's takedown attempts. Soon enough, a right hook would land for Alvarez, completely rocking the champion and sending him stumbling. An onslaught was survived by Dos Anjos before it went to the ground, but he would never recover, and Alvarez teed off with his opponent up against the cage before Herb Dean put a stop to it. Just like that, yet another title change and yet another shock: Just when you think you've seen it all, something else happens. What a start to International Fight Week.